- In order to trigger this mission you need to complete The Battle of Bunker Hill, but you must do it in a way that will not piss off Father or the Institute. If you did not bring back the Synths in the manner requested and refused to apologize for it, you’ll be Banished from the Institute and they will forever revert to enemy status. 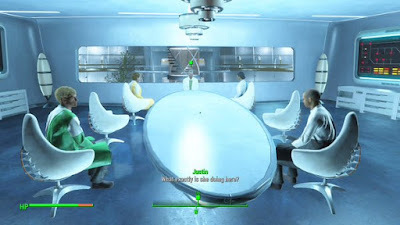 - Head to the Institute after returning from Bunker Hill and ascend to the top-most office on the eastern side of the hub. You’ll find the leaders of the Institute inside, and they’ll engage in a meeting. Listen to them chatter for a while and Father will appoint you as head of the Institute. Hey hey! Not bad. The quest more or less ends at this point, and you’ll gain a new one called Mass Fusion. You’ll also gain X6-88 as a companion. Your newfound Courser ally is nothing to sneeze at. X6-88 is a fierce combatant, capable of taking and dishing out a lot of damage. He also seems to be preternaturally good at sniffing out enemies from great distances, more so than some of your other companions, and given that he defaults to a laser weapon he can shoot a looooong ways away. This is both a blessing and a curse, as X6 seems to get you in trouble all the time. That’s saying a lot, given how problematic companions can get in combat situations. The problem with X6 stems from his hostility to freaking everybody, and their hostility towards him. If you bring X6 to the Railroad HQ you will automatically turn them into enemies, resulting in one hell of a fight. You can, by contrast, take X6 to the Prydwen without issue, but if you dismiss him at any point he will become hostile immediately thereafter and start attacking everyone in sight. He’s not happy about the Brotherhood at any other time, either, really, though he’ll really get jammed up if you ditch him on the Prydwen. In both cases, assuming X6 is going to be a long-term companion, you won’t be on speaking terms with the Railroad or the Brotherhood for much longer anyway. Still, you should be careful where you take this dude. He has issues.